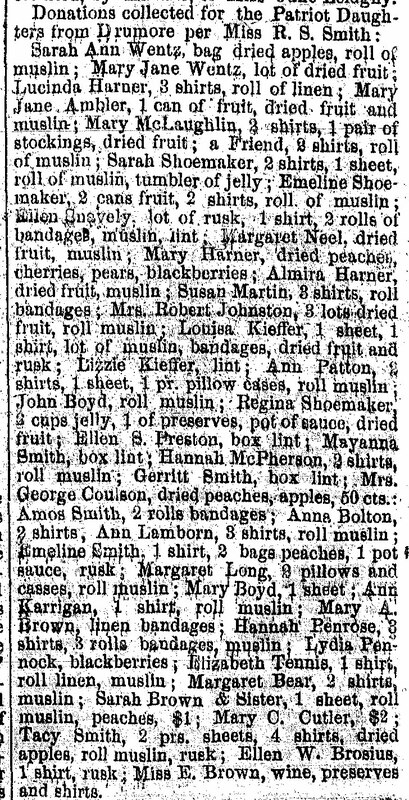 This particular donation list appeared in the July 14, 1863, Daily Evening Express, and contains the names of many residents from near Liberty Square in Drumore Township (not far from the Susquehanna River) populated by Quaker, Scots-Irish, and African-American families. Acting on the Patriot Daughters' behalf, Rachel S. Smith collected dried fruit, preserves, and hospital supplies from about forty of her neighbors. 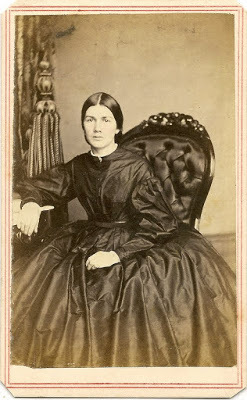 Rachel lived with her father, Joseph Smith, a wealthy Quaker farmer, on their farm near where Susquehannock State Park is today. Little else is known about these donations, but I was excited to find Rachel's photograph in a CDV album I purchased on Ebay a couple years ago. That album mostly depicts the extended family of her cousins, Annie and Edwin Shoemaker, and their spouses, John B. and Margaret F. Kensel, who were also siblings. Most individuals in the album belonged to the Drumore Friends Meeting at Liberty Square. 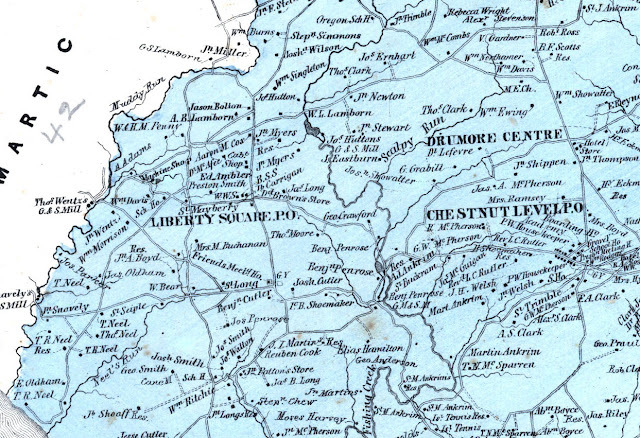 The women's well-fitted bodices, full and pleasingly-shaped skirts, and elegant trim--as well as the Philadelphia backmarks of almost all images--testify to a level of prosperity enjoyed by this neighborhood of southern Lancaster County farmers. 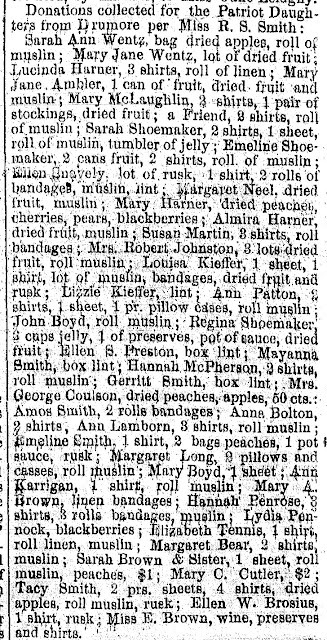 Rachel Smith's sister-in-law, Emmeline Smith (nee Tennis) also appears on the list, having donated "1 shirt, 2 bags peaches, 1 pot sauce, rusk." Emmeline's husband, George Smith, is listed in Pennsylvania records as one of six conscientious objectors from Drumore Township. See this link for a biographical portrait of their son, Gerritt Smith. 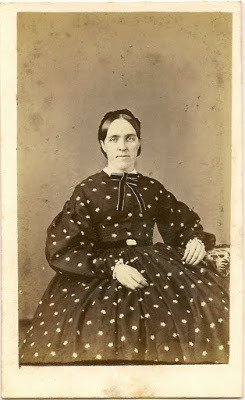 The third woman on the list who also appears in our photo album is Emeline Shoemaker (nee Lamborn), daughter of Smedley Lamborn, who had a farm near Joseph Smith and is linked to the Underground Railroad (see biography of his son, George). Emeline donated two cans of fruit, two shirts, and a roll of muslin. 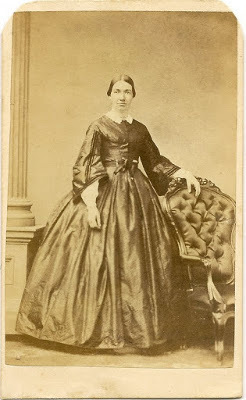 Three of her siblings are included in the album, including William Lewis Lamborn, who fought with Company E, 79th Pennsylvania, and Mary Elizabeth Lamborn, who married Thomas B. Hambleton of the same unit. Interestingly, their older brother, Aquilla Lamborn, is another one of the six conscientious objectors from Drumore Township.